Heat oven to 375°F. Grease cookie sheet. Heat milk and butter to boiling in 1 1/2-quart saucepan. Stir in flour; reduce heat to low. Stir vigorously about 1 minute or until mixture forms a ball; remove from heat. Beat in eggs, one at a time, beating until smooth after each addition. Stir in cheese. Drop dough by rounded teaspoonfuls 2 inches apart onto cookie sheet. Bake about 15 minutes or until puffed and golden brown. Serve warm with marinara sauce for dipping. You can prepare these puffs ahead. Cool puffs, wrap tightly and freeze. When ready to serve, place in muffin cups and heat in a 350ºF oven for 8 to 10 minutes or until hot. 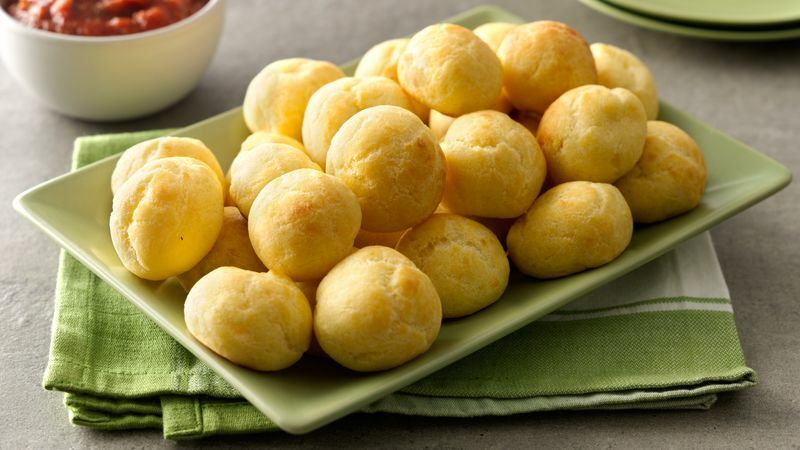 Add 1 tablespoon chopped fresh basil, oregano or parsley (or 1 teaspoon dried) to the flour to create Herbed Parmesan Puffs with Marinara.